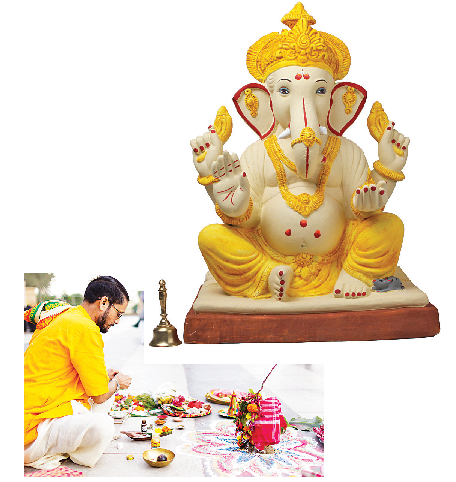 As Ganesh Chaturthi, the most beloved festival of Goa begins, Goans are busy sorting perhaps the most pressing problem they face every year during this festival: finding a priest to perform the pooja. It appears that over the years, the number of Goan priests is steadily dwindling, prompting people from neighbouring states to fill the vacuum. Whereas Naik has a fixed priest to attend to the pooja, Ankita Chavan from Vasco struggles to find one. “We rarely get a local Goan priest. Most of the times, he says he is too overburdened and sends someone from Karnataka,” states Chavan. “Goan priest gives first preference to his local ‘waddo’, and people like us who live in relatively new colonies have to make do with priests from other states. Additionally, the non-Goan priests also charge higher amounts,” Chavan’s words ring true when priests put forth their end of the situation. “There is indeed a shortage of priest, and this puts a lot of pressure on us,” informs Hemant Adhyapak, a full-time priest from Priol. “When we started in this business, there were six of us. My cousins and friends used to share my workload after taking care of their own business and regular jobs. But now, everyone has moved and there are only two of us, and we have to handle 70 poojas. This is in our own village, plus there are requests from outside. We have no choice but to straightaway deny these offers.” During Chaturthi, Adhyapk starts working at 6:45 in the morning, and is busy till 4 pm. “How much more do you expect me to stretch myself?” questions the helpless priest. VInayak Totekar, a priest based out of Mardol agrees with Adhyapak. “Last year I was forced to give up an entire ‘waddo’ of 50 houses where I used to attend to poojas.” informs Totekar. He has a crew of six priests who take up poojas in various areas of Goa “ Most of the priests are from Karnataka. The conditions have been worsening since last five years. When you arrange priests from outside, sometimes they do not show up on time, then I face pressure because I gave my word to the people.” Totekar currently attends to three ‘waddos’ in his village and has no ambition of expanding his footprint.